Cross-posted at Scientopia and Racialicious. 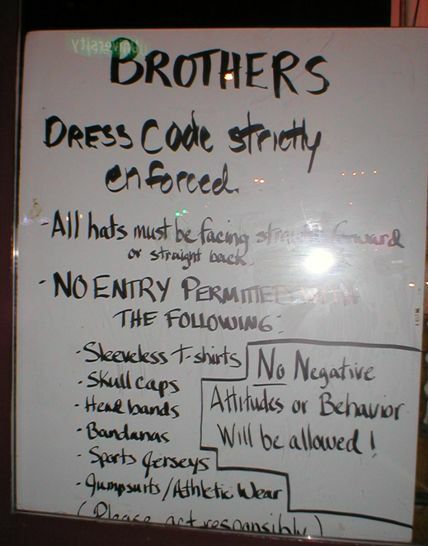 Several years ago I took this photo of the posted dress code for Brothers Bar in Madison, Wisconsin. As an alumnus, I can tell you that the relationship between the college community and the community at large was strained, as it is in many college towns. The college community was, on average, better off economically than much of the non-college community, with greater (potential) educational achievement, and overwhelmingly white. There was less mingling between the “town” and “gown” than we might expect by random chance, and some businesses tried to attract the latter exclusively. This was the case with Brothers Bar. Brothers sits within a block of campus, they wanted to attract the college students but push away young “townies,” as they were derogatorily called. Of course, it’s illegal to say “Poor Black people keep out,” so, instead, they use symbolic codes to warn especially Black members of the non-college community that they’re not welcome: no crooked hats, no skullcaps, headbands, or bandanas, and no sports jerseys. An enterprising journalist sat outside Brothers Bar to see just how the dress code was enforced. Not “strictly,” it turned out. The people who were turned away were overwhelmingly Black. Meanwhile, they let in students wearing UW sports jerseys and other Bucky the Badger-themed “athletic wear.” So much for color-blindness, this was a racist dress code with no reference to color at all. I was reminded of this incident when Stephen Wilson sent in photo of a similar dress code taken at Kelly’s in Kansas City. 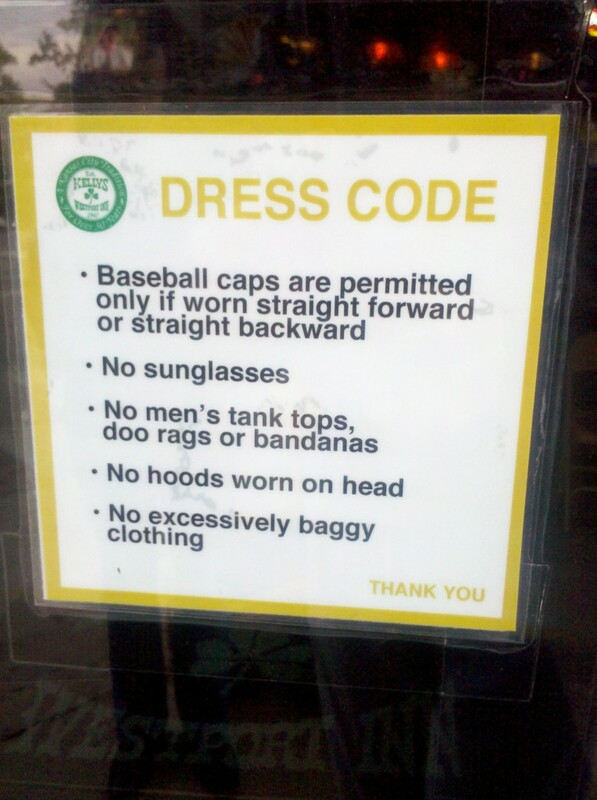 Again we see racially-coded restrictions: the same no crooked hats rule, doo rags and bandanas are disallowed, as are hoods actually worn on the head (but not the preppy hoodies apparently), and “excessively” baggy clothes. Turn those hats on straight forward or straight back, pull up those pants, and take off whatever’s on your head! It’s not that we don’t like Black people, we just prefer our Black people to defer to white standards. See? Not racist at all! Cheers! The tank top rule also seems to be aimed at excluding the LGBTQ community. aren't you being a racist by stereotyping black people by saying that they wear their pants low and hats differently? There's a similar dress code at a bar in Columbus's Arena District that I walk by all the time; in addition to the prohibitions against baggy clothes and the like, specifically "non-OSU athletic wear" is excluded. Completely playing the devil's advocate here: let us say that... well, I guess we should just use the word "allow" here, let's say that allowing black community members who don't conform to the whitewashed norm actually does hurt these businesses' margins in some way. What would be a proper solution, rather than instituting Jim Crow. I'm pretty sure that a bar in State College (home of Penn State) had a similar dress code, which is kind of baffling because the population of the town is somewhat whiter than the population of the university. It's also not as if they were trying to keep students out, since most are white. I guess it was just plan racist. Sure, maybe there's a good reason to threaten or rebel against the (white) establishment, but my point is, you can't put on an outfit meant to thumb its nose at the man and then be like, "Why is the man rejecting me?" I've been to dress code places where my friends and I are in blatant violation of the code but are allowed in because we're not scary, dangerous minorities. A better example, that I almost never see cited even in discussions like this (because honestly, I never really feel like begrudging any place of having a dress code): a year or two ago, Mother's Too bar in Chicago. Had a similar dress code (they're allowed). A group of college students from Missouri came to Chicago; mostly white, a few black. All the white male students were allowed in. All the black male students were denied entrance due to "dress code" (no information about whether women were allowed in, or were even present). Black students asked if they could go back to the hotel, change, and come back; denied. One black student switched his baggy pants for a white student's more fitted pants; white baggy-pantsed student was allowed in, black fitted-pantsed student was denied entrance. And so forth. Th dress code in and of itself isn't the issue, it's the fact that it often enough only seems to apply to black people (specifically black males). I would, however, like to see something similar in regards to women. I doubt very seriously that the sleeveless top rule applies to women at all (I can remember a couple of times that rule appearing without gender specifications outside restaurants I was at as a teenager, and worrying whether I'd be denied entrance, and being told that it "didn't apply" to me). Bars and clubs often expect women to come dress as skimpily as possible. But I wonder if black women have ever been told their outfits were "too skimpy" or possibly "too casual" (that was the only outfit I was ever warned about before going to a club) while white women in similar outfits were allowed entrance? Here's a thing... I am black, my father (also black) co-owns a bar which, guess what, has a very similar dress code! black people aren't born wearing doo rags and baggy pants! believe it or not blacks are perfectly able to adhere to a dress code just like anybody else. wearing ball caps at a jaunty angle isn't a integral part of our racial identity. It helps no one when people cry wolf concerning racism and such behavior actually hurts the cause of racial equality. And yes, i read the part of the article that stated blacks were being turned away at a much higher rate than whites, that's actual racism, why did the patrons wardrobe have to even enter the discussion? In New Orleans I have seen many bars with a sign that says "no white t-shirts." It also happens to be popular among young black males to wear baggy white t-shirts. Coincidence? Is an instructor of say, sociology, racist if they have a dress code for their class room? Obviously they are racist if they enforce their dress code only for one race, but simply having a dress code? Not seeing it. Wow, that is a *very* arbitrary dress code. Also shows a double standard in that they presumably are looking upon the wearers of these clothes as troublemakers, but have no problem with letting in the kind of semi alhoholic students who tends to get in fights. Oh, and the "no bad attitude" addendum only crowns it. Not only are they allowed to toss you out because of your clothes, but they have the mandate to toss anyone who protests their policy too. Unfortunately there is a dress issue that is prevalent that has to be checked by the masses of blacks, I'm talking about this wearing your pants down below your buttucks. As for discriminating because of the dress code, It is only consistent with the people who point those fingers. They have been doing this in the 1920's,1930's,40's,50's,60's until now nothing has changed. Sociological control has been a very successful tool for the one who beholds the tool. Sterotype has broaden to unbelievable areas of the so called Black experience. We have graduated into a position where our own people dispise thier own behavior, however it does no good to be discussed as another defect that we have. I quess you people need to do all you can to continue your fading quest for racial supremacy, while screaming out of the same mouth the unattainable word equality. I said it now attack me, so I can really know who is who come on! I personally called out a bouncer at Brothers for this. They've since added all-white t-shirts to the banned list. They wouldnt let my friend who is Latino in with his white t-shirt and nice jeans, until I pointed out the three white guys in the bar all wearing white t-shirts. I will never go there as an alum. I have never seen this kind of racially prescriptive dress code in the UK; not saying it doesn't exist anywhere, but I've not seen it. It would be unlawful under the Equality Act 2010 and other relevant legislation. You will quite commonly see signs that say "no singlets" (i.e. sleeveless tank tops) or "no workwear" (meaning overalls / dirty clothes); in seaside resort towns you'll commonly see signs saying shirts and shoes must be worn. More upscale establishments or nightclubs might say no jeans or no sportswear, but nothing so outrageously racially targetted. I would be appalled to see such plainly discriminatory signs and can only suggest that, especially with student bars in college towns, people can vote with their feet and encourage others to do the same. They can write to their student newspaper or start a campaign on Facebook. Even if you are privileged to be let in, they need your money more than you need their racism. One thing I find noteworthy, yet small, is the hat issue. How can you allow baseball hats, but only straight forward or straight back? If baseball hats weren't allowed at all, that would be one thing, but to disallow a style that in no way affects another person blatantly targets a specific population. People who own successful bars and clubs these days are very specific in the niche market they go after. They clearly believe that gangbangers or wannabees would chase away the preppy, fratty thing the bar has going up there. I can see why they would err on the side of caution, especially with the townie/student context you described there. Although maybe they could just put up a sign saying 'no townies, no gangbangers'. The fact that these businesses have to have exclusionary dress codes to bar individuals dressed "inappropriately" means that these businesses are in areas where they feel the need to erase the existence (or at least the appearance of the existence) of the local populations from within their walls in order to make the college populations feel more comfortable. Dress codes in "fancy" or "classy" (classist?) establishments tend to make demands on what should be worn rather than what shouldn't. These examples of dress codes specifically exclude certain articles of clothing, thus expressing a specific disapproval towards those articles and the people who wear them. There's a club in Seattle with a quite similar dress code. Thing is? To draw in customers, they have a mural up on their wall that shows black men dancing and (apparently) MCing. All of the figures on the mural violate the dress code that's posted prominently a few feet away. Symbolically, therefore, blacks are allowed in if they're providing the entertainment, but not if they're there to be entertained. Cultural appropriation at its finest. I read this article on Racialicious, and someone pointed out that Brother's Bar was started by UW alumni, which would explain why UW attire would be made an exception for. The TRUE racism litmus test would have been to see if any PoC sporting such attire were turned away. People have a right to set standards for their establishments, and people have the right to associate with people who follow similar norms of behavior. Complaining because a well behaved black person is preferred to a gang banger is the height of stupidity. I DO have a problem with the first bar: it should enforce its dress code evenly or not at all. But then this last paragraph just totally made me feel stupid for having read it. This is an old post but as a bar owner, every geographic area is faced with certain crowds that if let in WILL cause problems and scare customers. These signs are not racist they are necessary precautions needed to keep out thugs. You assume too much. If a white biker walks in with a bandana you had better believe the doorman will point at the sign and deny that person entry.